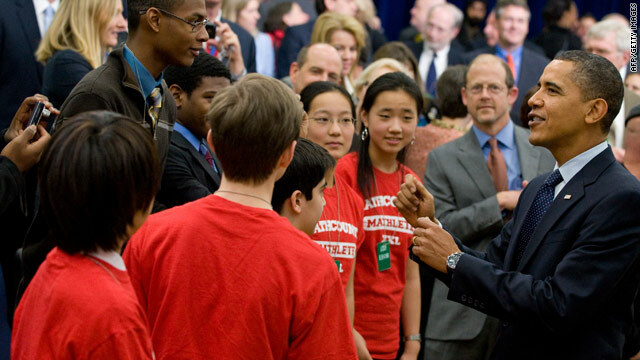 President Obama greets Washington-area students at an event Monday designed to promote science and math education. Washington (CNN) -- A conversation last week with South Korea's president apparently showed President Obama the stark difference between how Asian nations and the United States value education. Obama said Monday that the U.S. needs to restore the nation's leadership in educating children in math and science to meet future challenges, and he announced a new Educate to Innovate Campaign. He told how President Lee Myung-bak explained that demanding parents are South Korea's biggest education problem. "Even if somebody is dirt poor, they are insisting that their kids are getting the best education," Obama recalled the conversation, sounding almost whimsical in describing Lee's biggest education problem as parents wanting excellent schools for their children. In the U.S., a major challenge is to revive the interest, opportunities and abilities of students in math and science, Obama said. American students rank 21st in science and 25th in math compared with students around the world, he said, putting U.S. at a disadvantage on vital issues such as medicine, energy and security. The Educate to Innovate Campaign seeks to bring together teachers, parents, businesses and even the "Sesame Street" gang to promote math and science learning, Obama said. So far, the private sector has committed $260 million to the campaign, and corporate giants, including Intel, Xerox, Kodak and Time Warner Cable, have signed on, the president said. Specific programs include a two-year initiative on "Sesame Street" to teach kids about math and science, an after-school program focusing on robotics and a national "lab" day to provide millions of students with hands-on scientific learning, Obama said. Students will "have the chance to build and create, and maybe destroy just a little bit" to learn the joy of making things, rather than just consuming things, he said. In addition, the White House will hold an annual science fair to publicize the top achievements by scientists, Obama said. Noting that championship sports teams get invited to the White House, he said leading scientists should "stand side by side with athletes and entertainers" to encourage interest in young people. The goal, Obama said, is "expanding opportunity for all Americans in a world where education is the key to success." Referring to his conversation with Lee, Obama noted the "hunger for knowledge, an insistence on excellence, a reverence for science and math and technology and learning" in Asia. "That used to be what we were about," he said. "That's what we're going to be about again."